Increasing the growth of Scottish businesses was one of the key aims set out in the Scottish Government’s legacy plan for the Games, under the ‘flourishing’ heading. The plan includes an objective to leverage the hosting of the Games to allow businesses to grow and increase their international reputation for providing goods and services. In addition, it describes the two national legacy programmes – the Building Business Capacity and Awareness and International Business Profile programmes – developed to contribute to the increased growth of Scottish businesses. Included as part of the Business Building Capacity and Awareness programme was the Glasgow Business Portal, which was used to advertise procurement opportunities for the goods, works and services required to deliver the Games, as well as other public service contracts in the city. Reporting in October 2013, Scottish Business Insider indicated that of the contracts awarded so far, 85% had gone to Scottish businesses, and highlighted an initiative by the Games sponsors to engage with local businesses about the restrictions and regulations imposed during the Games period. This is an area in which major events like the Commonwealth Games can cause controversy. During the 2012 London Olympic Games, many local businesses argued that the event was actually having a negative impact on their trade, caused by spectators being concentrated in the areas of the city closest to the events, businesses missing out on passing trade due to the closure of tube stations, and transport restrictions causing disruptions to delivery schedules. 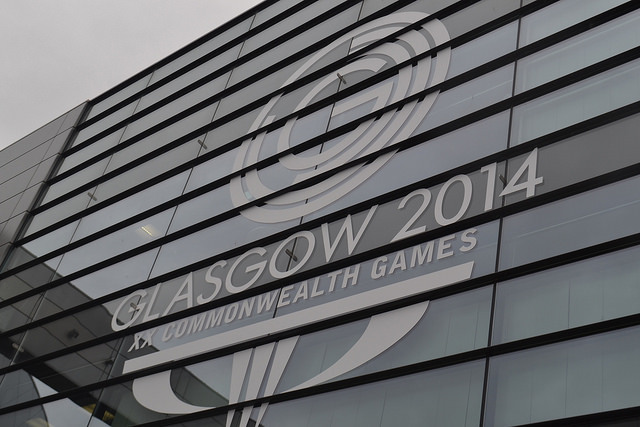 Similar complaints have already been made about the Commonwealth Games, with local business owners claiming to be losing out due to road restrictions and those who cannot afford to seek official Glasgow 2014 approval to market their services in relation to the Games being provided with a list of words and phrases they must avoid using for signs and products during the event. Concern has also been raised in connection to the decision to source the majority of official Games merchandise from China and Bangladesh, despite Games organisers stating at the time of awarding the contract to Northampton-based Venue Retail 2014 Ltd that merchandise would “showcase the designs and creativity of Scottish firms”. Despite the UK government’s announcement in its second evaluation report of the legacy of the London Olympics that its four-year, £11 billion target of economic benefits derived from the Olympics has been surpassed only 14 months following its conclusion, other estimates of the Olympic legacy have been mixed. A 2013 survey carried out by AXA Insurance suggested that only 2% of surveyed small businesses had seen any positive impacts in the year since the Olympics, and a November 2012 business panel organised by the Guardian found mixed feelings as to the benefits the event had brought. In its pre-Games legacy report, the Scottish Government itself noted “the available evidence on the plausibility of a lasting economic legacy is very limited” and while “evidence shows that some cities have seen increased business activity and tourism as a result of a boost to international reputation from hosting a successful major sporting event […] this is not a foregone conclusion”. Whether Glasgow’s local businesses enjoy a longer lasting impact from the Games than their London counterparts remains to be seen. No doubt the Scottish Government is hoping for more success stories like Tunnocks (who saw sales soar following the teacakes’ inclusion in the Commonwealth Opening Ceremony) rather than the reported reduction in sales experienced by some London businesses following the 2012 Olympics. This entry was posted in Business and economy and tagged Business, commonwealth games, economic benefits, Economic development, economic growth, economic impact, economy, impact, legacy, local business, major sporting events, Olympic Games, sport, sustainability. Bookmark the permalink.